Wells Fargo presented a $1,550 check to Women Aware on Wednesday. Support from generous donors, like Wells Fargo, allows Women Aware to continue providing safety and services to all victims of domestic violence, including underserved, low-income, and minority families. Thank you for helping survivors move beyond abuse. The Renee J. Bradley Foundation for Domestic Violence 2nd Annual Scholarship Luncheon took place on Sunday, April 7, 2019. The luncheon was hosted by the Reverend Dr. Danielle L. Brown, Pastor of Church Life, Cathedral International. The keynote speaker was Phyllis Adams, MA, MSW the Chief Executive Officer of Women Aware.This event was created to raise awareness of domestic violence and to award Perth Amboy, NJ High School Seniors attending a 4-year university Scholarship opportunities. 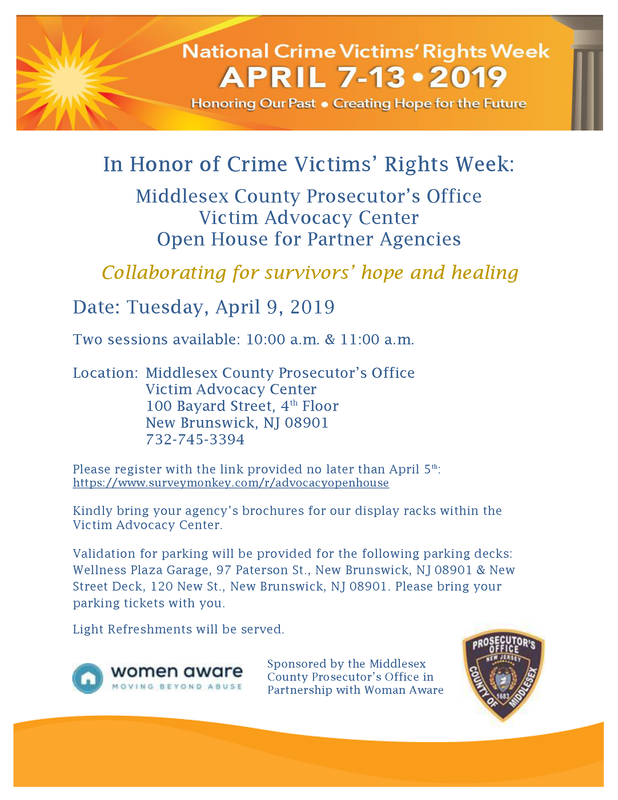 Two sessions available: 10:00 a.m. & 11:00 a.m.
-1 out of every 8 domestic violence victims seeking services in New Jersey. -Answered over 4,900 hotline calls, provided nearly 30% of counseling services to children affected by domestic violence in N.J., and delivered 4 times more services to survivors compared to the state average. NEW BRUNSWICK–Paul Sansone Sr. of Sansone Automall presented a $6,250 check to Women Aware on behalf of the Sansone Foundation on Wednesday. Sansone Automall also runs a work-force reentry program, providing skills and employment opportunities to those in need under the leadership of Mr. Sansone. While accepting the check, Women Aware Board President Diane Palmer expressed, “We are very grateful for Mr. Sansone’s continued generosity.” Mrs. Palmer began as a volunteer at Women Aware’s shelter over 25 years ago. NEW BURNSWICK–Windows of Understanding, a public art project rooted in social justice, returns January 21-February 28 to more than 30 storefronts throughout New Brunswick and Highland Park. Artists paired with non-profit organizations interpret the question “How do we see through hate?” and transform local businesses into windows of understanding. Mahsa Biglow, a master’s level student at the Rutgers Mason Gross School of Art, was matched with Women Aware. The artist created a “warm,” “glorious” and “epic” installation of femininity, strength, and safety through textiles (pictured). You can see Biglow’s installation and learn more about Women Aware’s mission at the American Hungarian Foundation (AHF)​, 300 Somerset Street New Brunswick, Tuesday-Friday 10-3 or Saturday 9:30-1 until February 28th. NEW BRUNSWICK–Six-year-old Ariella Hopkins of Milltown had just graduated kindergarten in June 2015 when she passed away from a sudden illness. Since then, her parents, Bobby and Lisa, have worked tirelessly to keep her memory and smile alive. Every year, the family holds a toy drive to benefit children in need. Women Aware was honored to have been chosen as a recipient this past year. With the help of the Hopkins donation, Women Aware provided over 1,000 toys to 250 children in three days. On behalf of those we serve, thank you Hopkins family for making a difference to children in need through Ariella’s memory. NEW BRUNSWICK–The state Department of Community Affairs has awarded Women Aware a $80,197 grant to support our emergency shelter. The grant will be used for renovations in a shelter that provides over 8,000 nights of refuge every year to survivors and their children seeking shelter from abuse. “A separate $80,197 grant from Shelter Support was awarded through the state Department of Community Affairs to was awarded to Women Aware, the agency started in 1981 that provides assistance to women and families escaping from cases of domestic violence. The money will be used for renovation work and the purchase of equipment and furnishings for the emergency shelter for women and there children in Middlesex County. NEW BRUNSWICK–On Thursday, Prosecutor Andrew C. Carey and the Middlesex County Prosecutor’s Office dropped off over 100 toys for children and their families at Women Aware. Prosecutor Carey and his team have long been strong allies in keeping survivors safe and protected in Middlesex County, NJ. Thank you for this generous donation during the holiday season.